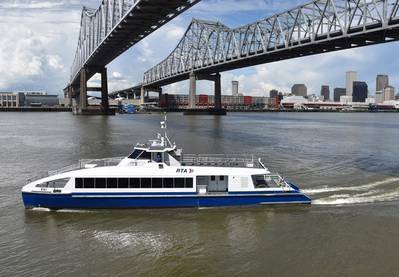 A pair or 105-ft., 150-passenger high speed aluminum ferries built by Metal Shark have completed construction and are ready to enter service for the New Orleans Regional Transit Authority (RTA). The first boat was completed earlier this year and delivered to New Orleans in July. The second vessel is 100% complete at Metal Shark’s Franklin, La., shipyard where it passed U.S. Coast Guard inspections at the beginning of October and is ready for delivery to New Orleans at RTA’s discretion. The new passenger ferries, RTA 1 and RTA 2, will replace the decades-old ferries currently operated in New Orleans. The ferries were designed by BMT Designers and Planners and built to meet the specific requirements of the RTA. The USCG Subchapter “T” compliant ferries are powered by twin 715-horsepower Cat C-18 Tier 3 diesel engines and feature a proven, low wake/low wash, high efficiency hull design for reduced environmental impact. The most recent deliveries confirm Metal Shark's arrival as a dominent boatbuilding force in the U.S. “In the past 18 months, we have delivered over fourteen 150-passenger and 350-passenger ferries to New York, Washington, DC, and now, New Orleans,” said Metal Shark CEO Chris Allard.